"I had a purpose over there." "You got one here, too." FS is proud to exclusively debut the official trailer for a film titled Sgt. Will Gardner, another emotional drama about soldiers returning home from war with PTSD, struggling to reintegrate into society. 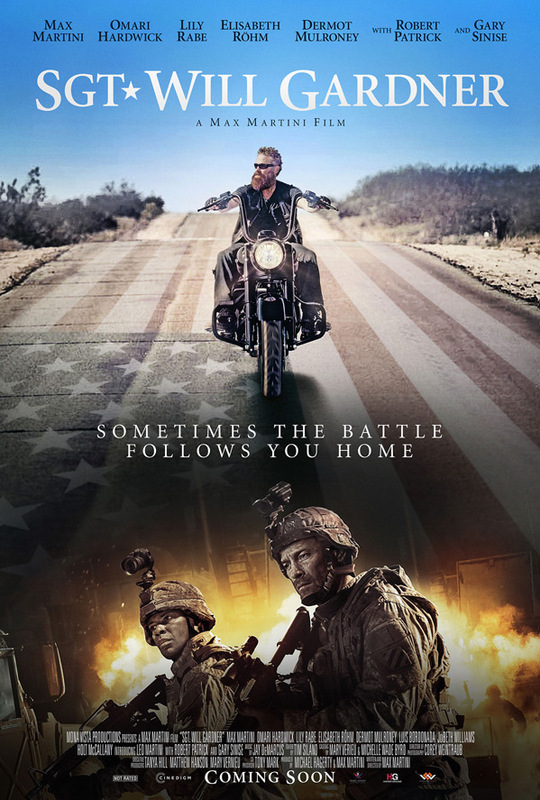 Actor Max Martini writes, directs, produces, and stars in this film as Will Gardner, an Iraq War veteran who sets out on a cross-country motorcycle journey with the plan to reunite with his young son. "My hope with Sgt. Will Gardner is to raise awareness for the on-going battles which returning soldiers encounter," said Martini, whose production company, Mona Vista Productions, will donate a portion of the film's proceeds to three charities which support veterans suffering from Traumatic Brain Injury (TBI), PTSD and veteran homelessness: Higher Ground, Warriors Heart and the Gary Sinise Foundation. The film also co-stars Lily Rabe, Luis Bordonada, Dermot Mulroney, Elisabeth Röhm, Omari Hardwick, Gary Sinise, JoBeth Williams, Holt McCallany, and Robert Patrick. See below. For more info and updates on Sgt. Will Gardner, visit the film's Facebook page or follow @SgtWillGardner. Sgt. Will Gardner tells the story of Iraq War veteran Will Gardner (Max Martini) who is suffering from a traumatic brain injury (TBI) he sustained with his platoon while in combat. His injuries make it difficult for him to reintegrate into society. After a series of setbacks, he embarks on a spirited motorcycle journey across America with the goal of reuniting with his son. Along his journey, he tries to pick up the pieces of the life he’s lost since returning from combat. His PTSD causes frequent flashbacks to the Iraq War which he survives by having frequent conversations with Sam (Omari Hardwick), his best friend and war buddy. Sgt. Will Gardner is written, directed, and produced by American actor-turned-filmmaker Max Martini, directing his second feature film after making Desert Son in 1999 previously. Cinedigm will release Martini's Sgt. Will Gardner in select theater + on VOD starting January 11th right at the beginning of the New Year.